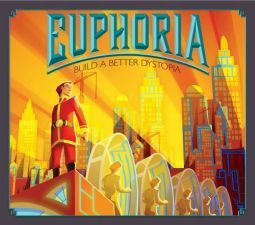 Euphoria board game is a worker placement game with the goal to claim ownership of the dystopian world by generating commodities, digging tunnels to infiltrate opposing areas, construct markets, collect artefacts, strengthen allegiances and fulfil secret agendas. 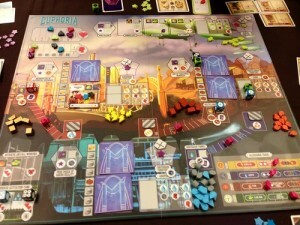 Euphoria is designed by Stonemeier Games who also produce Viticulture, they have made good use of kickstarter to bring their game ideas to fruition. Within Euphoria you lead a team of workers represented by dice. The number on each dice represents the workers’ knowledge (level of awareness of being in dystopia). Your workers’ knowledge will enable bonuses throughout the course of the game and have an impact on your interaction. Be warned, if the knowledge of your workers combined gets too high, one of them may wish to leave you. For your workers you have two tracks on the board called Morale and Intelligence. You want to aim to keep their morale high (hand size) and their intelligence low (knowledge of being in dystopia) in order to prevent them leaving you. You also have two elite recruit cards at your disposal. One has already pledged allegiance to you but the other still needs some convincing. Throughout the game you will come across milestones which will allow you to reveal and use the reticent recruit. Or you can let other players in the game reach those milestones for you unknowingly. The board itself is full of different options. Workers you place around the board will give you different actions. This is usually a combination of getting resources. Either simple resources or resources that are more valuable that tend to require the use of the simple resources (raw materials). You can also get cards that act as resources, help build markets with finished resources or get more dice by giving up resources. Your way to victory is marked with your hard workers, the strength of your allegiances and the tunnels you have dug to infiltrate other areas of the world. However, the destination is a land grab in the means of area control. To complete this you will need to build markets that enforce restrictions of personal freedoms upon other players, which changes the face of the game and opens up different paths for your victory. This game is designed for 2-6 players, working best with 4-6 players. 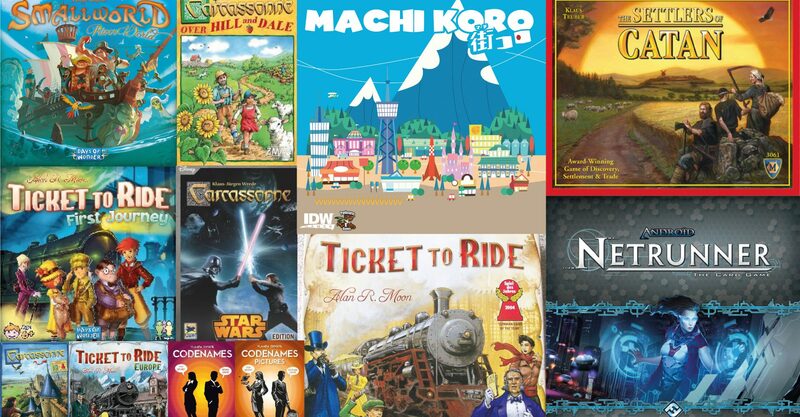 Once you’ve learnt the rules you can play a game in under an hour. Recommended age is 13+ younger ones will need a bit of help. There is a fair amount of luck involved in the game which helps give some variety to the game. The different paths to victory mean not everyone is aiming for the same thing.